Hello MMS. Well, it’s been quite a week nationally, and there’s much for our families and students to process. Sentiment across our community seems to be, among other things, a desire to do something, a call to action, a pull to get involved. So our proposal is to take some of your energy and direct it super locally, in our great SOMA schools. Let’s get involved with our children’s education. Let’s get to know our kids’ classmates and their families. Let’s donate time and money to our schools. Let’s promote the cultural and fine arts. Let’s model tolerance. Let’s explore differences. Let’s teach our students about civics and the basics of American government and the power of democracy. Let’s raise the next generation to be informed, to be engaged, and to vote! If you’re looking to donate funds to our school to support wonderful programming, scholarships, enrichment, and much more courtesy of your HSA, you can do that HERE. And if you’d like to donate your time in any capacity at all please contact your HSA volunteer coordinator Val Frost at vfrost3656@gmail.com. Ok! Thanks so much to all of you for your involvement and your caring. And with that, here’s what’s going on at MMS and in our town this week (there’s a lot) …. SIXTH GRADE SOCIAL: What better way to inject some much-needed fellowship and fun into this week than with the 6th grade social?! 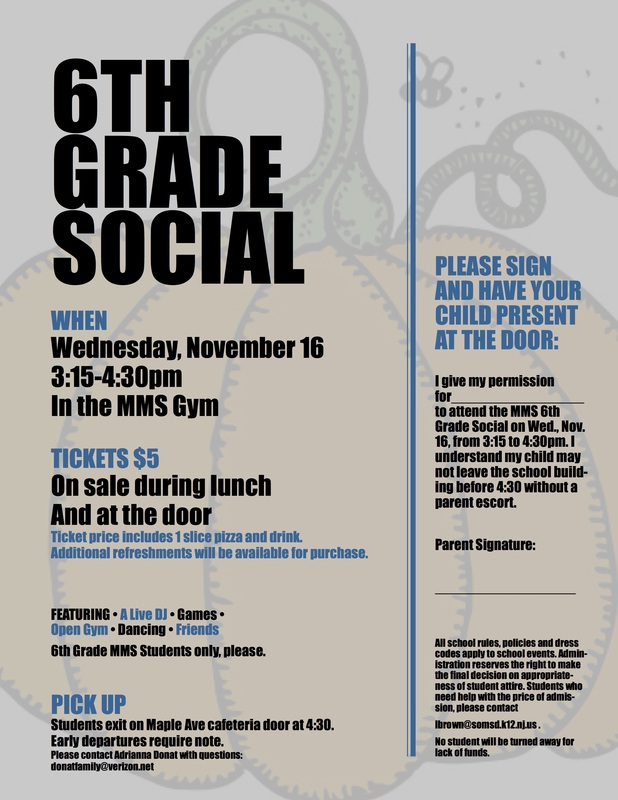 On Wednesday, November 16th all 6th graders are invited to enjoy an after-school social event in the MMS cafeteria & gymnasium. We’ll have a live DJ, games, an open gym, food, dancing, and more! Don’t let your 6th grader miss all of the fun. Tickets are $5 and include a slice of pizza and a bottle of water. To attend every student must have a signed permission slip which can be found HERE. Tickets will be sold in advance at lunchtime and at the door (as long as the permission slip has been signed). Parents -- want to help out? Please see the SignUp Genius HERE to contribute your time or items and help make this event a success for the kids. PHOTO RETAKES: Photo retakes for all students is Tuesday, November 15th. If your student already ordered and received a photo package, please have him/her return that package to the photographer during the reshoot. If not, to pre-order online visit www.lorsstudio.com, click on Undergrad Prepay, and use online login code 17-44MM. If you purchase online there is no need to send an order form or payment into school. Otherwise, you may complete the form that was sent home and have your student bring it to school on photo retake day. If you did not receive a photo form and/or you have any questions about placing your order, please contact Lors Photography at (908) 964-0847. MMS SPIRIT WEAR: Last call! If you don’t purchase this week you’ll miss out on your chance to buy the latest and coolest MMS garb for you and your students. MMS Spirit Wear makes a great holiday gift! Please shop HERE before the sale ends. Any questions? Please reach out to Lynn Salort at lsalort@aol.com. TGI FRIDAYS MMS FUNDRAISER: Please print the flyer HERE and bring it with you to TGI Fridays at 495 Prospect Avenue in West Orange on Wednesday, November 16th from 12pm-10pm -- 20% of sales that day go to our MMS PBIS committee. Thank you in advance! PBIS COMMITTEE MEETING: The next PBIS Committee Meeting (Positive Behavioral Interventions and Supports) will be held on Thursday, December 1st from 3:30pm-4:30pm in MMS Room 291 (this is a new date). Parents are welcomed and encouraged to attend and participate! Please reach out to Ms. Felder at jfelder@somsd.k12.nj.us with any questions. STUDENTS FOR SOCIAL CHANGE: No better time than now to get your kids involved in social activism. Our YouthNet after school club Students for Social Change meets at MMS on Wednesdays from 3:15pm-4:15pm and currently has openings for more students. Any questions? Please reach out to Ms. Felder at jfelder@somsd.k12.nj.us. The Performance Agreement and Parent Volunteer forms for Cast & Assistant Directors were due last week. If you haven’t already, please send these into school with your students asap. Set construction started last weekend and we need more builders! Pleaser reach out to Mr. Palmgren at rpalmgre@somsd.k12.nj.us if you’re willing and able to volunteer your talents. MMS BATTLE OF THE CLASSES: Battle of the Classes has begun! To earn Spirit points for their grades students may participate in Penny Wars, donate non-perishable goods & gifts for local organizations, and send in Box Tops to the main office. Want to contribute to Box Tops without clipping? Download the mobile app and use to scan receipts: http://www.boxtops4education.com/bonusapp. Any questions? Ask Ms. O’Sullivan at mosulliv@somsd.k12.nj.us. MMS STUDENT COUNCIL: A huge thank you to all of you from Student Council for your support of our School Store and our Cougar Cash program! Between all of your amazing donations and our successful Dance-A-Thon, Student Council is off to their strongest start in years. Way to go, MMS! MMS YEARBOOKS: The MMS Yearbook is now on sale! The yearbook is organized by MMS teachers Ms. Hansen (mhansen@somsd.k12.nj.us) and Ms. Varney (rvarney@somsd.k12.nj.us), who can be contacted with any questions. The flyer outlining how to order online or in school can be found HERE. And information on purchasing a “Well Wisher” for inclusion in the yearbook can be found HERE. SOMSD POLICY ON TRANSGENDER AND GENDER NONCONFORMING STUDENTS: Did you and your children know that our school district passed a new policy with respect to the treatment of our transgender and gender nonconforming students? Please take a moment to review this important statement that serves to ensure our schools are safe, supportive, and inclusive learning environments for all of our students. The policy can be found HERE. ​UNDERSTANDING YOUR CHILD’S RACIAL IDENTITY: The Parenting Center and the Elementary PTAs invite you to a presentation by Dr. Khyati Y. Yoshi on Monday, November 14th at 7:30pm at South Mountain Elementary School, which will focus on talking about diversity and social justice with our children. All info on this timely and important meeting can be found HERE. POWERSCHOOL TRAINING CLASS FOR PARENTS: The district is hosting two PowerSchool training classes for parents on Wednesday, November 16th at SOMS -- one from 4pm-5pm and another from 7pm-8pm (parents only need to attend one session). Learning how to use and access PowerSchool allows parents to know at all times how their children are performing in school. For more information, please see the flyer HERE. SCREENAGERS: A free community screening of the film Screenagers and a discussion afterward, moderated by public radio’s David Brancaccio, about the impact of screens on our kids will take place on Wednesday, November 16th at 7pm at South Mountain Elementary School. You can find all the info HERE. TURKEY TROT: The Two Towns 5K Turkey Trot and Kids’ Fun Run is Saturday, November 19th. It’s a great event to promote fitness and community! All the info is HERE. Thanks so much, MMS. We’re so grateful for our amazing school community and we’re looking forward to continuing to work together for all of our students and families.